Looking To Purchase A Mountain Bike? Your First? Second? Let Us Help. Choosing the Right Mountain Bike Doesn't Have to be Difficult. Numerous manufacturers provide bikes that are specifically developed to tackle tough terrain and rigorous riding. The most important factor when determining which mountain bike to get is your personal riding preference. The first thing you have to do is ask yourself a few questions. Are you going to ride in the mountains? Are you going to just ride on some dirt roads? Do you just like the idea of a mountain bike and you're just going to ride on the street? All of these things will determine which is the right mountain bike for you. Let's start with the easiest of those. Let's say you like the look and style of a mountain bike, but the reality is the most you will be doing with it is going on some dirt roads. At that point anything that we carry that is basic and looks like a mountain bike is going to be a good buy. It's still going to have a more dual purpose tire that will be knobby, but it will still roll smooth on the street. That would be the first thing. Most of the time you will have 21 speeds, an aluminum frame, Shimano or SRAM components. Pretty basic. At this point you don't even need disc brakes. You can get a linear pull brake or a v-brake, and you'll be fine. It would be much better for you to get an upgrade in components than to opt for an upgrade to disc brakes at the entry level. 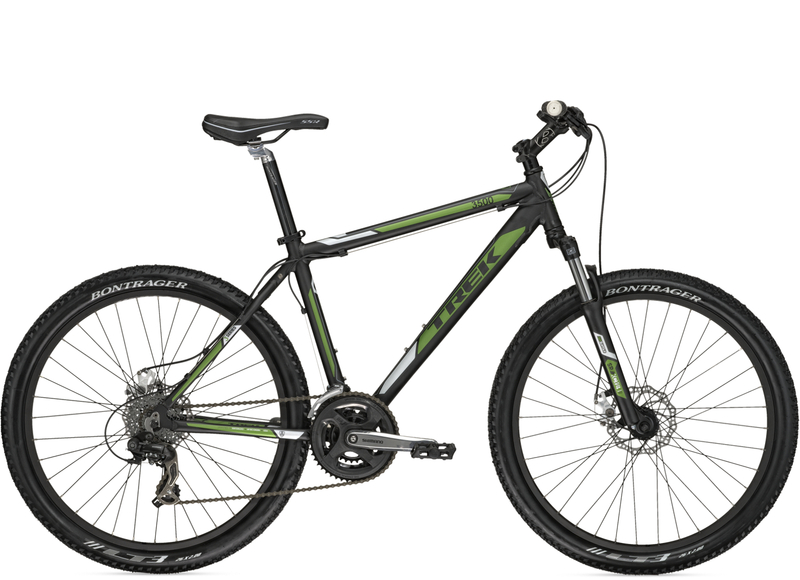 Take the 2013 Trek 8.2 Dual Sport for example. It's a go-anywhere machine that is road-bike fast, hybrid-bike capable and fun everywhere. It's lightweight aluminum frame and 63mm travel suspension fork so it floats over roads and paths. 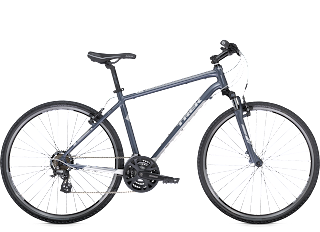 21-speed Shimano Gears and safe, grippy brakes are at your disposal. acceleration and quick climbing. 80mm travel suspension fork dispatches bumps with ease, grace, and confidence. Quick shifting 21-speed Shimano Drivetrain that will make easy work of the hills. 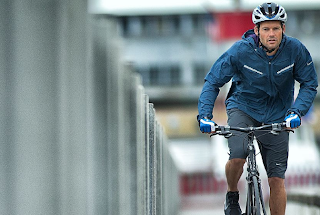 Bontrager tires and disc brakes in all conditions and any weather. 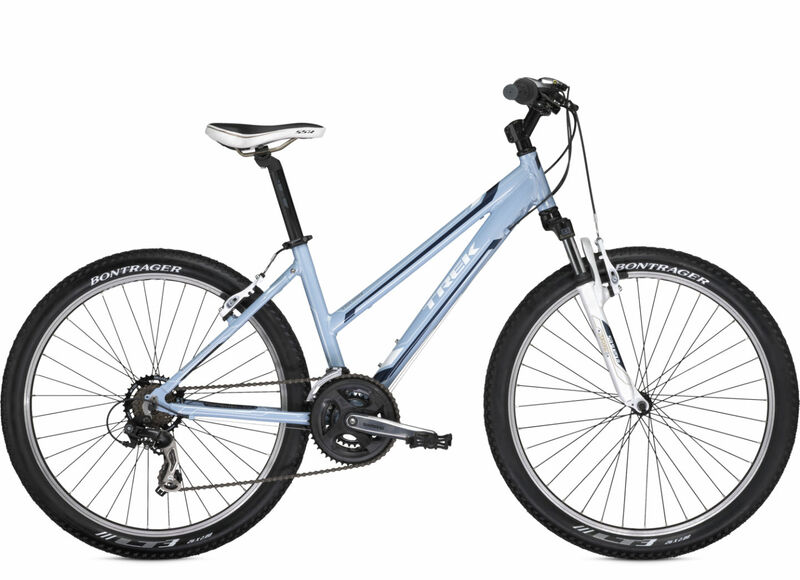 For the ladies, Trek has their 2013 Skye. It's a fun, all-around bike ready for any and all adventures. 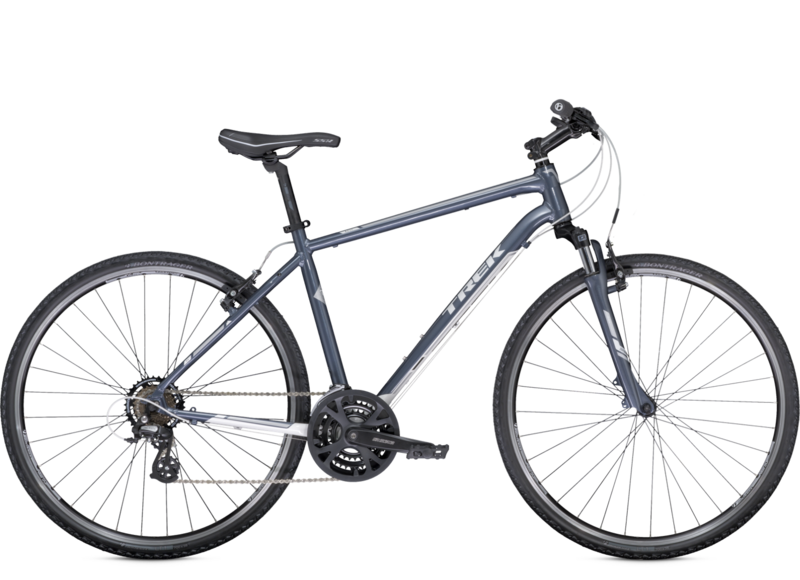 It's got their great-riding, lightweight aluminum frame in a relaxed, upright riding position. The downtube is not as tall as the boys frame, allowing you to stand over the bike easier. It comes in "Washed Denim," and "Canary Yellow." Next, for the guy or girl that wants to do a little bit of mountain biking, but not to do extreme jumps or dropoffs. Maybe you just want to hit some local trails with your friends. One of the first features you'd look for is: an adjustable front fork. You want a front shock that has enough travel and enough adjustability to hit those bumps and take up the shock and abuse of hitting rocks and potholes and rain-ruts. The next thing would be looking into disc brakes. The more serious you get about riding, the better brakes you're going to need because of the dirt, mud and grime. You will need better stopping power in those dirty conditions and on steeper descents. You will probably still get an aluminum frame but will get an upgrade from 21 gears to 24(8 gears in the rear). Going up and down hills requires a little more precise shifting than just on flat ground. 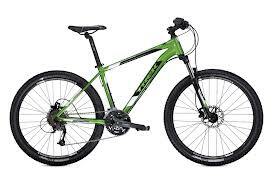 On this type of bike you can go mountain biking often and expect it to live up to the use or abuse on the trail. 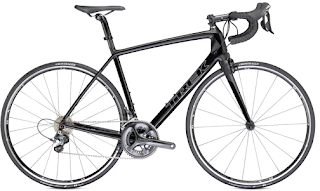 A good example of this type of bike is The 2013 Trek 4300 Disc. It's perfect for this category because it has the Gold aluminum frame, and is plenty tough to hold its own in the durability department. It has been bumped up to a 100mm-travel SunTour suspension fork for control, easy pedaling 27-speed Shimano drivetrain, a plush seat, and versatile tires on dependable wheels. It aso comes with Hayes disc brakes. The next level up means you have been riding the trails a bit and now you need a new bike. You're going mountain biking every weekend, hitting all the local trails and going to harsher conditions to ride. At that point you're going to be looking for something with longer travel on the front fork that will be larger in diameter. You may get many more features on the front fork, including lockout or damping control. 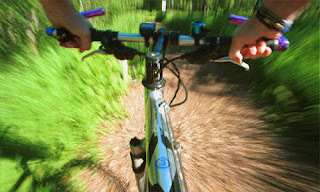 The better the front fork, the better the bike will handle in adverse conditions. You may want to go to hydraulic disc brakes even rather than cable disc brakes, kind of like upgrading to power brakes on a car. The rims on the better quality bikes are double walled, and the spokes come out of a reinforced "eyelet" rather than just a hole in the rim. This makes them much stronger and better able to handle rougher terrain. At this point you may want to get that full suspension bike, whereas for a first time rider would want to stick to a hardtail. Another consideration when purchasing a mountain bike would be whether to get 26" or 29" rims. This is completely based on preference. The larger diameter (29") wheel is gaining popularity amongst experienced and novice alike. Having 29" wheels allows for better traction due to a larger contact patch with the ground as well as the ability to roll over trail obstacles with more ease while maintaining momentum. The novice rider may find more confidence riding through technical terrain. The trade-offs with bigger wheels are slower acceleration and increased weight due to the mass of the larger wheels and tires. The last consideration is weight. When you are selecting a mountain bike for racing, it's important to keep the weight of the bike down. Mountain biking at a higher level requires riding up and down hills of all sizes, over obstacles with frequent braking and acceleration. The lighter your bike, the easier it is to accomplish these feats. Never sacrifice strength and durability for weight. Remember that you can always come in and demo a bike to find out what works for you. We have a lot of options and sometimes you just need to sit on different bikes to figure it out. 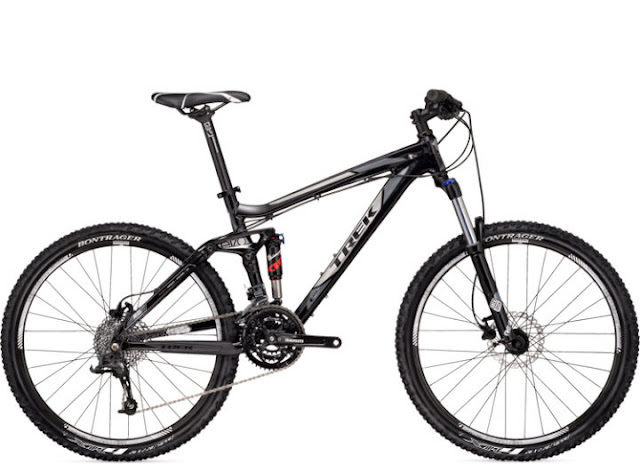 Another great bike not listed here is the 2013 Trek Mamba 29er. Learn all about it here.